Antonio Carluccio, a much loved cookery writer and television presenter, is the proprietor of London's Neal Street Restaurant and the author of several bestselling books including An Invitation to Italian Cooking, A Passion for Mushrooms, Passion for Pasta and Carluccio's Complete Italian Food. In October 1999 he was made Commendatore of the Italian Republic. He lives in London with his wife Priscilla and together they have recently created Carluccio's, the specialist Italian food shop, and Carluccio's Caffè, both in London's West End. Carluccio has presented two hugely popular TV series - Antonio Carluccio's Northern Italian Feast and Southern Italian Feast - and has made numerous appearances on BBC2's Food and Drink. 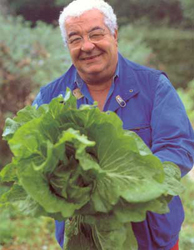 Antonio Carluccio is a bestselling author and recognised the world over. "All my life I have eaten more vegetables than meat. This is not the result of some conscious decision  I don't do it because I'm on a health kick or practising to become a vegetarian, it's because I love vegetables and don't just see them as side dishes. This is how Italians are  they do not have a 'meat and two veg' way of thinking. For them, the veg are not 'also rans', overshadowed by prime hunks of meat or glistening fish; they can be the stars of the show too. Although Italians love meat  just think of their fondness for game, veal, hams and salamis  they will eat whole meals made up entirely of vegetables, not because they want vegetarian food, but simply because they do not assume a meal has to contain meat. Meat and vegetables are equally valued."